It is commonly said that we fear what we don’t understand. Living up to our American ideals requires us to understand our neighbors, our colleagues, and our friends despite our diverse backgrounds. Yet in recent years, Muslims in America have rarely been portrayed as nuanced and complex human beings, and the reality is that most Americans say they don’t know a Muslim personally. 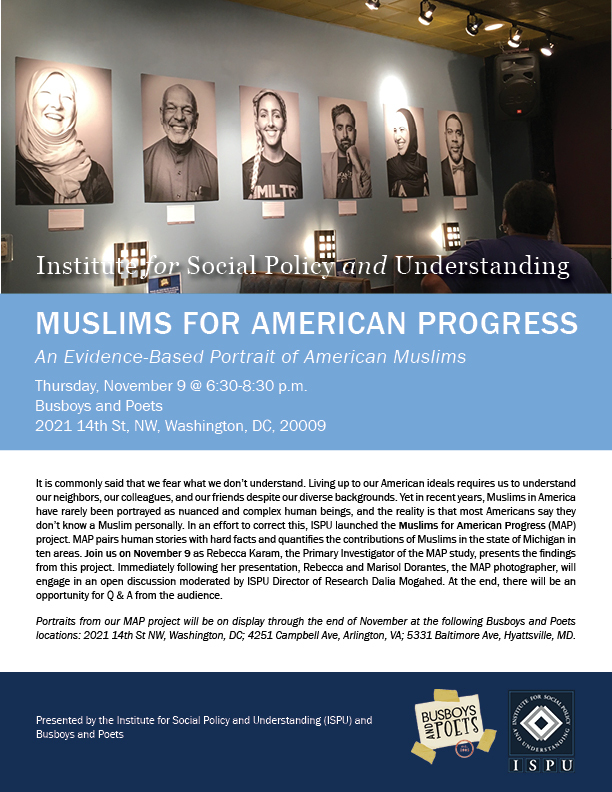 In an effort to correct this, ISPU launched the Muslims for American Progress (MAP) project. MAP pairs human stories with hard facts and quantifies the contributions of Muslims in the state of Michigan in ten areas. Join us on November 9 as Rebecca Karam, the Primary Investigator of the MAP study, presents the findings from this project. Immediately following her presentation, Rebecca and Marisol Dorantes, the MAP photographer, will engage in an open discussion moderated by ISPU Director of Research Dalia Mogahed. At the end, there will be an opportunity for Q & A from the audience. Portraits from our MAP project will be on display through the end of November at the following Busboys and Poets locations: 14th & V St. in Washington, DC; Arlington, VA; Hyattsville, MD.